YEOSU, South Korea, August 13, 2012 (ENS) – United Nations Secretary-General Ban Ki-moon Sunday introduced the Oceans Compact, a new initiative to support and strengthen implementation of the UN Convention on the Law of the Sea. At an event in the city of Yeosu marking the 30th anniversary of the year the international treaty was opened for governments to sign, Ban proposed a results-oriented Action Plan to address the host of challenges the oceans face – a warming climate, acidification, pollution from land-based activities, spills and destructive fishing practices. “The seas and oceans host some of the most vulnerable and important ecosystems on Earth, but the diversity of life they host is under ever-increasing strain,” Ban said. Ban introduced the Oceans Compact on the closing day of the Yeosu World Expo, a 93-day celebration with the theme of “The Living Ocean and Coast.” More than 100 countries and international organizations participated and eight million visitors attended. The Yeosu Declaration, pursued as part of the legacy of the Yeosu Expo is intended to enhance public awareness of dangers facing the oceans and to promote the necessity of international cooperation for turning these challenges into hopes for the future. 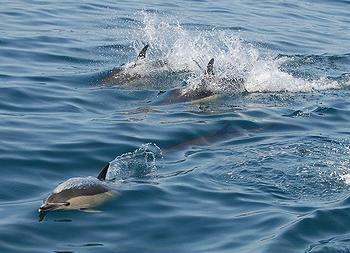 The Law of the Sea Convention, also known as the “constitution of the oceans,” governs all aspects of ocean space, from delimitation of maritime boundaries, environmental regulations, scientific research, commerce and the settlement of international disputes involving marine issues. It was first opened for signature in 1982 and entered into force in 1994. There are 162 governments that are parties to it – 161 States and the European Union – but not the United States. 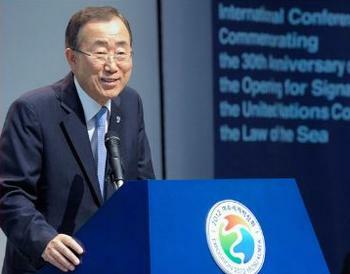 In Yeosu, Ban praised the achievements of the Law of the Sea Convention in helping countries establish a legal framework to guide the management of the oceans, the settlement of disputes, and the administration of the international seabed. “Among its principles, the Law of the Sea recognizes that all ocean issues are related and that they need to be addressed as a whole,” Ban said. This is in line with the development framework put forward at the UN Conference on Sustainable Development, Rio+20, held in June in Rio de Janeiro, Brazil. The Compact will provide a platform to help countries protect the ocean’s natural resources, restore their full food production to help people’s whose livelihoods depend on the sea, and increase awareness and knowledge about the management of the oceans. The United States has not ratified the Law of the Sea Convention, and today Interior Secretary Ken Salazar said that puts the country at a disadvantage. “It’s a terrible shame the United States has not signed off on that treaty,” Salazar told reporters on a conference call from Alaska. 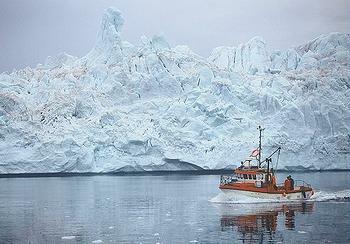 The warming climate is bringing ever more traffic through the Arctic – adventure travel through the Northwest Passage, the Bering Sea, the Chukchi Sea and the Beaufort Sea, said Salazar. Many countries are increasingly interested in exploiting ocean resources, and they are doing so under the Law of the Sea Convention. “The President supports the Law of the Sea treaty,” said Salazar. But as with all treaties, the 100-member U.S. Senate must ratify the Law of the Sea Convention by a two-thirds vote. Only then can the President ratify it. On July 16, 2012, the U.S. Senate had 34 Republican Senators who have indicated their intention to vote against ratification of the Treaty if it comes to a vote. Although the treaty will not come up for a vote in the Senate until after the November elections, Senate Foreign Relations Committee Chairman John Kerry, a Massachusetts Democrat, has mounted a new push to have it ratified. The treaty is supported by the U.S. Navy and the oil and gas industries, who say it is in the U.S. interest to be able to participate in developing international maritime law and governing disputes at sea. Critics of the treaty argue that U.S. accession to the Law of the Sea Convention is unnecessary to secure the legal basis for companies to fully exploit oil, natural gas, and mineral wealth on the ocean floor. They warn it is inconsistent with U.S. sovereignty and accession to the treaty could force the United States to abide by international restrictions on greenhouse gas emissions and make U.S. companies pay royalties to a United Nations body. Other Senate Republicans, such as Senator Richard Lugar of Illinois, support ratification of the treaty. The issue has split Senate Republicans.